Enjoy outdoor dining on the Marsh view deck Seats 6. Quaint Cape Cod home with spectacular Marsh views on a private Cul-de-Sac. Enjoy the back yard marsh with waterviews at high tide twice per day and gorgeous sunsets from the deck. Take a short stroll to Boat Meadow Beach and enjoy a swim or walk the flats at low tide. Please feel free to use the the rolling beach cart with All-terrain wheels that will carry 4 of the 6 Beach Chairs and cooler which are provided plus it will hold your large beachbag. After the beach, you can wash the salt off in the private, sunny outdoor shower. There is a convenient clothesline for towels and bathing suits, etc. Enter the kitchen and main living area through the mudroom/laundry room with washer and dryer. There is an open floor plan with spacious living between the Living room, Dining room, and Kitchen. The Kitchen has a peninsula with bar-seating for enjoying a cup of coffee or conversing over cocktails. The Dining room has a table with seating for 6. The Living room has a couch, 2 comfortable chairs and a TV. There is also an outdoor dining table with seating for 6 on the deck. First floor has a separate family room at the end of the hall with 36“ cable TV, leather couch and a recliner. Next door is a bedroom with two twin beds. 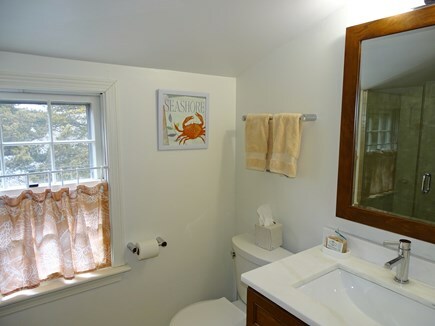 A nautical themed Bathroom with tub/shower combination is on the first floor. Second floor has a bedroom with a King bed in 2019, and a bedroom with Queen bed. 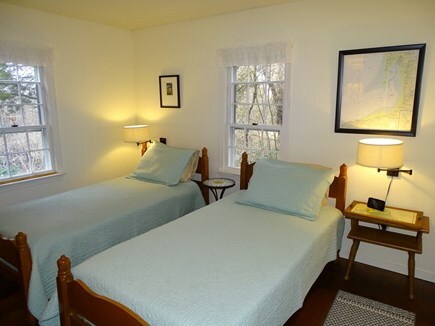 Each of the upstairs bedrooms has 2 windows, reading nooks with comfy chair in one and loveseat in the other. They each have 2 closets, built in dresser drawers and luggage racks. The downstairs bedroom has 2 windows, a closet, dresser, chair and a luggage rack. All bedrooms have room darkening cellular shades. For your convenience there are 2 hair dryers, an iron and ironing board. All bedrooms are air conditioned and each has an atomic digital alarm clock with a USB charging port. There are two TV’s with cable that includes NESN for local sports, Wifi internet, DVD player. For the not so sunny days there are plenty of good reference and reading books, games, crayons and paper, puzzles and a card table to play them on. Other amenities include a refrigerator with filtered water ice maker, gas top Stove with electric convection oven, Microwave, Dishwasher, washer/dryer on main level, Poland Springs water dispenser, and a new in 2019 natural gas BBQ grill with side burner. The well equipped kitchen has a blender for making frozen drinks, a 4 piece toaster, Keurig pod coffeemaker, a full pot Coffee maker, and a french press for the coffee lovers. There is a Lobster pot complete with claw breakers and plastic tablecloths. Kitchen towels & shower matts are provided. Bed Linens, towels and beach towels are not provided but they can all be rented and delivered from Cape Cod Linen Rentals (cclinenrental) if you like. Local shopping, restaurants and markets can be reached using back roads avoiding Rt.6 and 6A. Bring your bikes to ride along the Cape Cod Rail Trail that you can access just up the street from the house. Fresh water ponds (Herringbrook pond and Great Pond) are nearby. Many attractions close by include Rock Harbor fishing fleet, the National Seashore, Wellfleet Audubon Sanctuary, an old fashioned Drive-in theater in Wellfleet, Truro Vineyards with wine tasting and tours, and just 20 miles to Provincetown where you can have lunch, shop, browse art galleries or take a Whale Watch. There is ample off street parking with an additional circular driveway. Marsh Mellow more than exceeded our expectations! Laurie and Paul were terrific hosts and their cottage is comfortable and cozy. 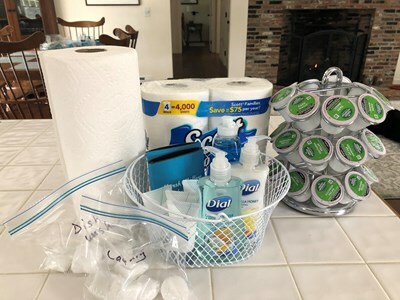 The property is very private and quiet.The house was very clean and roomy and included everything we could have possibly needed including a fully stocked kitchen. The cottage is conveniently located to restaurants, shopping, bike trail and the beach. Boat Meadow Beach is now my favorite beach on the Cape! It was only a short walk from the house. Quiet and not crowded. Early August and there were a few times we were the only ones on the beach. Easy to walk in the water with the sandy bottom. Low tide brings long walks out to shallow tidal pools. The sunsets were amazing. We also enjoyed the short bike ride to Rock Harbor for the sunset party there! Laurie was awesome to work with. She offered so many helpful suggestions about where to go and what to see. She really went out of her way to make sure our vacation was relaxing and enjoyable. We really enjoyed our week at this house, in part due to the warm character of the house itself, great outdoor area with grill, and view of a nice marsh, and a quick (5 min) walk to Boat Meadow landing, with warm calm water that's perfect for kids and grandparents. The house is centrally located between Wellfleet (15 mn drive), Orleans (5 min), and Chatham (15 min). Highly recommend. Our fourth stay in this lovely house. Well built for a family with a couple of youngsters, and well taken care of. Nice, comfortably furnished, with A/C if needed in the bedrooms, and separate TVs in two downstairs living areas. Boat Meadow Beach is a relaxed walk away and offers a tidal river that is swimmable even at low tide in the Bay and at the warmer Bay temperatures, although we did also enjoy some trips across to boogie board in the surf at ocean beaches. The ambiance of this marsh together with the trees behind the house offers sightings of a wide variety of birds and home to a few rabbits. We also enjoyed a cookout, eating around the table on the back deck after cooking with the gas grill. Our twelve year old granddaughter joins us in looking forward to next time. Paul and Laurie are the new owners in 2018 of the “Marsh Mellow” beach house. We have both been coming to the Cape with our families since we were very young and have aways wanted to wind up here and now here we are in our dream house that we plan to retire to. Our primary home is in the Metrowest area where we live and work. Thank you for inquiring on our home. The marsh view out our back door is spectacular and the close proximity to Boat Meadow Beach makes this the best vacation home anyone could wish for. The open space plan leaves ample room for family gatherings that can spill out onto the deck with it's spectacular Marsh view. Since we are coffee lovers we have provided a Keurig pod coffeemaker, a full coffee pot maker, and a french press for the coffee lovers. 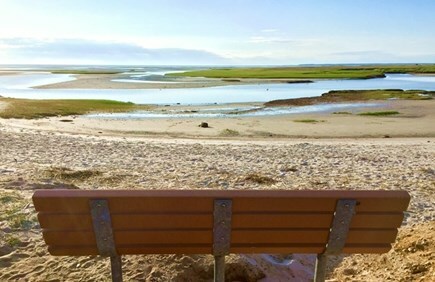 Eastham on the Bay side of Cape Cod has some of the prettiest beaches including Boat Meadow Beach which is just a short stroll from our Beach house. Enjoy swimming at high tide or walking the flats at low tide. Eastham also has some of the best restaurants and shopping on the Cape and is close to so many attractions.